I forgot to Zero Out my Camera! That was what I was saying out loud this week (inwardly I was thinking much stronger stuff) when I discovered I had forgotten to change a setting on my camera from the night before. This caused me to take terrible pictures of some of the SU basketball players at the banquet on Sunday. We have all been there. Photograph something and forget about all the changes made to get the exposure right then and get bad exposures the next time we start to photograph. For me, the night before I was doing long exposure photography for High Dynamic Range (HDR) images which is totally different than a banquet filled with people and using bounce flash off low ceilings to get fast enough shutter speeds to light tall people with short people. So, in an effort to save you (and me) future aggravation, I want to tell you about Zeroing Out your camera. Zeroing Out is a process of going through the most used settings on a camera and putting them back to the start settings BEFORE using the camera. Some people call this their base settings or starting point. I then take a couple of quick snaps and review the photos on the camera’s LCD screen before leaving the house or, if on vacation, before leaving the hotel area. If the photos look bad or the photo’s Exif data is not right, I probably forgot to zero out. Kind of a failsafe procedure. By doing this, I know I am starting at a point I am very familiar with and can easily make changes as needed from there. If I am taking a lot of photos or the light changes dramatically, I might zero out my camera on a few occasions during the shoot or day. The advantage of Zeroing Out before you start shooting is huge. Much easier to do in the calmness of your home or hotel room than when you notice you have taken ten photos that are over or under exposed and you can not retake them again because the opportunity is gone. Worse, trying to fumble around to find which setting needs to be changed while someone is waiting. Talk about pressure. Imagine if that person is a bride or a Disney character and your daughter with a line of families behind you. Guilty on both accounts. I learned the hard way and still need to remind myself. What are these settings I am talking about? That depends, the blog writer says with a broad smile. The ones most of us need to be aware of is Shooting mode (P, S (Tv), A, M), ISO, Exposure mode, White Balance, Image Quality, Exposure Compensation (EV), Shutter (Single or Continuous) and Focus Area (matrix, center-weighted, spot, etc.). You might have more or less settings depending (there’s that word again) on your camera and what you consider important. For Point and Shoot cameras, it might be as simple as putting the camera back to full Auto mode from another mode or scene used previously. Another thing to be aware of is if you use a Vibration Reduction (Image Stabilized) lens. Make sure its settings are where you expect them to be after mounting it on the camera. I set mine to ON and Normal mode. On a recent thread about this subject of Zeroing Out on a photography board I read, each photographer had different zero out settings. Just as each of you will, too. All that to give me an excuse to show you another HDR image. Take care and don’t forget to Zero Out Your Cameras. You’ll thank me someday. 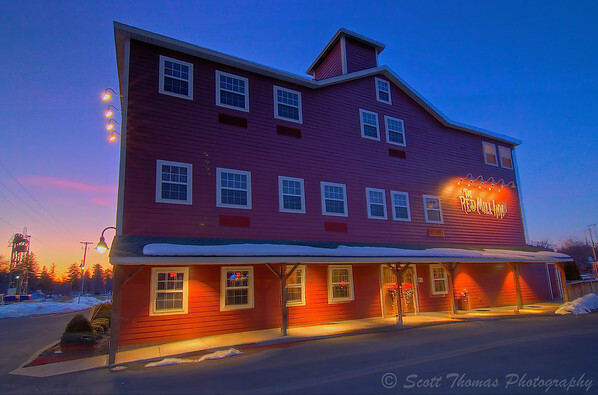 The Red Mill Inn of Baldwinsville, New York, at sunset. Five photo HDR image taken with a Nikon D70 and Tokina 11-16mm f/2.8 lens. Processed in Photomatix and Apple Aperture 2.1. This entry was posted in Photography, Travel and tagged apple aperture 2, baldwinsville, hdr, high dynamic range, new york, nikon D70, paper mill island, photomatix, red mill inn, sunset, tokina 11-16mm, uwa, wide angle, zero out. Bookmark the permalink. 21 Responses to I forgot to Zero Out my Camera! Thanks, Tracy. Yeah, we usually learn this process the hard way. There is nothing more annoying than after taking what you think was a great shot, you realize you’ve got the wrong setting. Aye, back at you, my fellow photographer/blogger. Very very nice!! HDR is a very effective way of making interesting photos. I´m glad you have been informing us so much about it, and keep showing photos made that way. One day I will try to make some too. HDR is a fun process to learn and use. The book I reviewed recently is an excellent way to do so. That is a very interesting perspective–almost makes the Inn look like a movie set, as if when I went through the front door I’d be stepping out into the back lot. Of course all of that makes me want to step right into the picture and trot around the side to see what I can see. I find that “zero out your settings” is pretty much good advice for all of life. Oh yes, I know it all too well. White Balance setting usually gets me! Yep, have had my share of all blue or green images from forgetting to change the white balance. Thanks for all the information, pics and tweets on the Iditarod, Mike! Thanks, Anna, the Red Mill Inn is a warm place inside, too. Dust bunnies on the sensor are a pain in the you know what. I always zero out the camera (well, almost always), LOL! Great HDR image! Guilty as charged. 🙂 Curses! Thanks Scott, I’ve only used my manual every now and then and didn’t know that you have to zero out. I certainly wouldn’t be able to get that shot with my auto mode. My zeroed out setting is using the P (program) mode of my camera. I rarely use manual myself but was for this set of photos for the HDR image I had in mind. Sunsets is another time I use manual a lot. Very good advice! I will try to remember this, Scott.